Provide comfort for the family of L. Olive Greider with a meaningful gesture of sympathy. 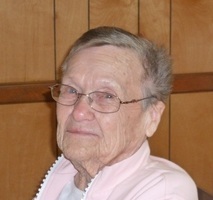 LYDIA OLIVE (TORBERT) GREIDER, 96, of Delta, PA, died on Friday, February 15, 2019 at the York Hospital, York, PA. She married the late James Owen Greider on February 16, 1947 and had been married 61 years at the time of his death. .
Born on Christmas Day, 1922, in Peach Bottom Township, Delta, PA, she was a daughter of the late Elmer Gantz Torbert and Nora (Mobley) Torbert. She was the step-daughter of the late Byron Hughes and the late Steward Dooley. She was preceded in death by her sister, Etta Louise Torbert Shackelford, a nephew, Roland L. Shackelford, Jr. and step-sisters, Isabelle Hughes Tarbert, Dorothy Hughes Kilgore, Helen Dooley Atkins and Margaret Dooley Ayres. Olive attended the former Delta High School, graduating in 1939. She served on Delta High School Reunion Committee, organizing reunions as far back as the 1970s and continued to serve as a resource for the committee in recent years. She worked at the Edgewood Arsenal in the 1940s and resigned in 1951. She was a teacher’s aid to the second grade of Delta Peach-Bottom Elementary for a brief period and served as a census taker. She joined the Fawn United Methodist Church at the age of 9 and transferred to the Slateville Church in 1936. At the time of her passing, she was the oldest member of the church and had been a member for over 82 years. Olivia, Owen, Wyatt, and Emma Kate Margaret Greider, all in Indiana. A Celebration of Olive’s life will be held on Saturday, February 23, 2019 at 11 a.m. at the Slateville Presbyterian Church, 307 Slateville Road, Delta, PA. Church pastor, Reverend Kenneth Osborne will officiate. Following the service, the family will receive guests in the social room at Slateville Church. Obituary loving written by her family. To plant a memorial tree in honor of L. Olive Greider, please visit our Heartfelt Sympathies Store. We encourage you to share your most beloved memories of L. Olive here, so that the family and other loved ones can always see it. You can upload cherished photographs, or share your favorite stories, and can even comment on those shared by others. I am so sorry to hear about the passing of Aunt Olive. She was a very kind and thoughtful woman. My sincere condolences to her family. May she rest in eternal peace.